Hopped a flight to AZ yesterday, en route again to Colorado for a little fun. I got a chance to snap a few photos of the Southern California mountains to check snow conditions. Baldy Bowl is starting to look bare, even above the Ski Hut, though I'm sure there are still a few good snowfields to be found. Interestingly, the South aspects between the two summits still look terrific. Gorgonio has snow, and presumably the north aspects are still in good shape on both mountains. 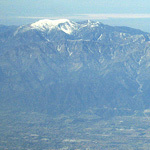 Our flight took a sort of angle over San Jacinto. Didn't get a chance to see the Snow Creek route (north facing), but I got a great view of Round Valley and the east face. I've definitely been intrigued by the north side of baldy. I got a good view of it from Baden Powell at the beginning of the month. Let me know if you want to plan a trip in the next few weeks. I guess I'm still clinging to my non-SoCal fair weather ways and think that three miles of dry hiking approach is too much. We'll see how picky I still am in the next few seasons, but for now I think it's time to break out the mountain bike and rock climbing gear!